Wisdom teeth are a third set of molars that develop during the late teens and early twenties. Most people do not have enough room for their wisdom teeth. As these teeth come in, they can affect dental alignment and lead to significant oral health concerns. Dr. Jon Marc Van Slate offers gentle, safe extractions for wisdom teeth at his Houston, TX, practice. With his experienced care and minimal-discomfort techniques, patients can be feel at ease during treatment. It is very rare for wisdom teeth to develop and erupt without any issues. Often, these new molars can push other teeth out of alignment. In addition, wisdom teeth can develop at an angle, causing damage to surrounding teeth. 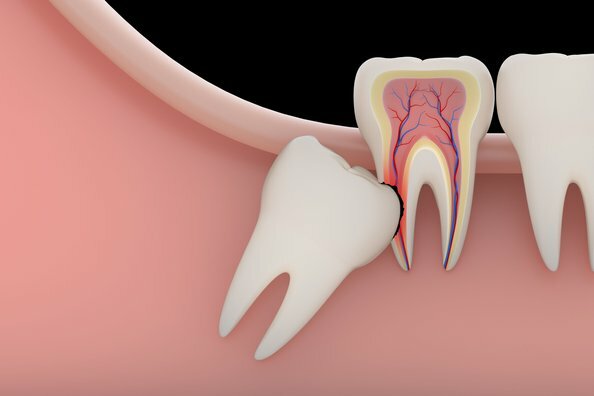 You will need extraction especially if you develop an impacted tooth. This occurs when a tooth cannot fully break through the surrounding tissue. This area can trap bacteria, causing inflammation, bad breath, and chronic pain. A simple general procedure to extract wisdom teeth can prevent many of these problems from developing. Dr. Van Slate is honest and conservative. Though the vast majority of people need wisdom tooth extraction, it is not necessary for everyone. He will carefully evaluate your needs, making a treatment recommendation in your best interests. If there is not enough room for wisdom teeth, or they are developing improperly, he will recommend extraction. To determine the timing for removal, Dr. Van Slate will take x-rays to monitor the development of incoming teeth. Before wisdom tooth removal, Dr. Van Slate will administer local anesthesia, using the revolutionary Anutra anesthetic system. This system is more comfortable and efficient than traditional methods of delivering anesthetic because it reduces the acidity of the solution injected. In addition, the medications will take effect more quickly. Dr. Van Slate can also provide dental sedation to ensure your comfort. After administering all necessary medications, Dr. Van Slate will carefully and gently remove your wisdom teeth. He will use your x-rays to determine the most suitable method for you. In the simplest cases, he will gently loosen the teeth from the surrounding tissue before lifting them from the sockets. If you have an impacted tooth, he will need to remove the tissue that is covering it. For easier removal and less impact to surrounding bone, he may divide the tooth into sections to take out one piece at a time. Removing wisdom teeth at a younger age can lead to faster healing and recovery after treatment. Wisdom tooth removal is a widely performed procedure that involves negligible discomfort, and can have tremendous advantages for your overall dental health. Without proper care, your incoming wisdom teeth can cause serious dental misalignment. Dental misalignment can increase your risk for decay, temporomandibular joint (TMJ) disorders, and bruxism. Wisdom tooth extraction can improve your oral health for many years to come. Early extractions are also able to offer more significant benefits. Removing wisdom teeth at a younger age can lead to faster healing and recovery after treatment. In addition, the procedures are more easily completed because the teeth and surrounding bone may not be fully formed. Having wisdom teeth removed can prevent many oral health concerns from developing. To learn more about wisdom tooth removal and to find out if the treatment is appropriate for you, contact our office today.